Come home for the holidays! It’s Christmas Walk time! The 2018 Oswego Christmas Walk, presented by Allied First Bank, will be held from 5 to 8:30 p.m. on Friday, Nov. 30, throughout downtown Oswego, with your same favorite traditions plus new activities that will make this year even more fun for all ages. View and download the full 2018 Oswego Christmas Walk program! Help Cindy Lou Who usher in the holiday season with a Seussian twist on the traditional tree-lighting ceremony. The tree lighting begins at 5:30 p.m. at Oswego Village Hall, and features live choral music from Bednarcik and Thompson Junior Highs. While you’re there, toast s’mores over the open fire with local Girl Scout and Boy Scout troops, take a Belgian horse-drawn wagon ride, warm up by the fireplace with storytelling and send cheer to pediatric cancer patients by making cards with Bike Bald. 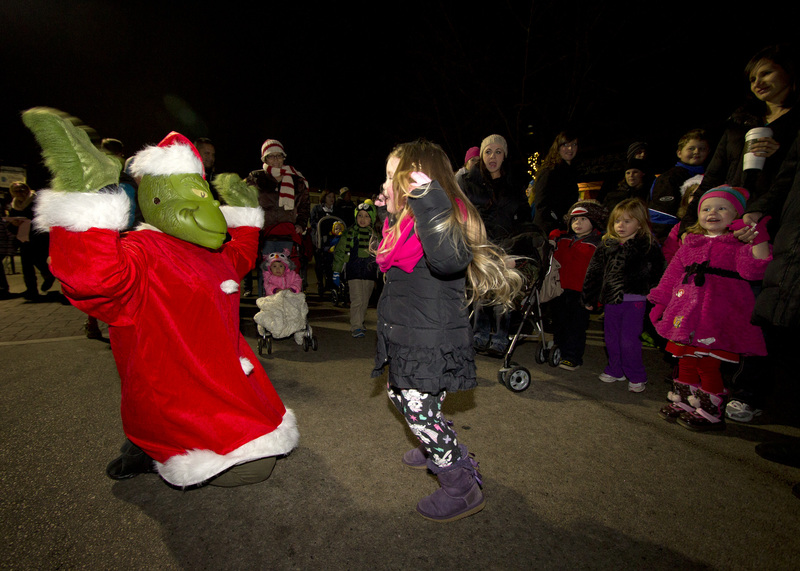 Main Street festivities begin at 5 p.m. Go skating on the faux ice skating rink, watch an ice sculptor, slide down the giant inflatable sled hill, take a ride on the Toyland train and much more – all for free. Plus, dozens of local Oswego organizations will offer games, crafts, giveaways and prizes and food for sale all night! Bring your wish list and camera and visit Santa at the Garden Faire beginning at 5 p.m. Be in line before 7:45 p.m. to guarantee your visit with the Jolly Old Elf himself. For older kids, join in on some reindeer games with the Oswegoland Park District, offering $5 laser tag battles behind the post office, then join in on the fa-la-la-la-ha-ha-ha with improv comedy at the Little White School Museum. And at 7:45 p.m., make way for the silent, illuminated fire truck parade featuring all your favorite holiday characters down Main Street. Avoid the congestion of downtown traffic! Trolleys will operate a shuttle route from Oswego High School to the corner of Main and Van Buren Streets. Trolley service is free, and the last run will run from 4:45 to 9:30 p.m.
Find fun all weekend long! The fun continues Saturday morning with Breakfast with Santa, brought to you in partnership with Oswego Foundation for Educational Excellence and the Oswego Rotary Club. Fill up on pancakes, play games, make crafts, and visit with Santa Claus, all benefitting Oswego 308 classrooms, from 8:30 to 11:30 a.m. at its new location at Oswego High School. See page 14 or www.oswegofoundation.org for more details. The annual Cookie Walk will also be held from 10 a.m. to 4 p.m. Saturday morning in downtown Oswego. Purchase a tin for $10 in advance at Floral Expressions, Hudson Design House and Kimberly Ann Home Decorating, and go door to door visiting downtown businesses to collect a different freshly baked cookie in each shop. Tins go on sale Monday, Nov. 19, and often sell out early, so buy yours in advance. New this year, recreate It’s A Wonderful Life in downtown Oswego. Stroll down Main Street, transformed through music and decorations into Bedford Falls. Shop the local merchants, and at 4 p.m. bring your cash or non-perishable food donations to “Bedford City Hall,” at the Oswego Cyclery, to celebrate the movie’s final scene and remember those in need this holiday season. A downloadable 2018 Christmas Walk program and map will be available Monday, Nov. 19, right here at www.GoOswego.org and on the Village’s website, www.oswegoil.org. Attendees can also get up-to-date information, learn the Christmas Walk shuffle from Christmas Tree Rex and more on the 2018 Oswego Christmas Walk presented by Allied First Bank event page on Facebook. The 2018 Christmas Walk is supported by generous contributions from Allied First Bank, Two Men and a Truck, Oswego Area Chamber of Commerce, Imagination Print and Design, Imperial Service Systems, Kane, McKenna and Associates, Ancel Glink, Alarm Detection Systems, Old Second National Bank, MetroNet, G.A. Blocker, Meade Electric, Frost Electric, K. Hovnanian Homes, Schoppe Design Associates, Hennesy’s River View Ford, Lakeshore Recycling Systems, HR Green, Fox Metro Water Reclamation District, Longhorn Steakhouse, All Around Garage Door, The Safe and Fair Food Company, Groot, Clarke Environmental, Ferguson Waterworks, Herc Rentals, Metropolitan Industries, KR&G Excavating, AY McDonald, the Home Depot and Portillo’s. 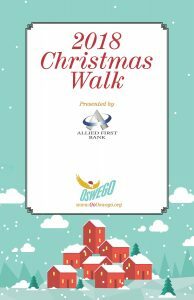 The 2018 Oswego Christmas Walk, presented by Allied First Bank, will be held from 5 to 8:30 p.m. on Friday, Nov. 30 throughout downtown Oswego. Photo Credit: Locked In Photography, in downtown Oswego.